Place an ad for your rental home or homes and increase the market visibility of your rental property. You can decide who to rent and even accept credit card prepayment of your rental. Rest in the Peacefulness of Casa Nirvana.- Architect designed two story residence surrounded by mature secluded gardens in a private, tranquil setting close to the Casa. Spacious Open Plan Kitchen, Dining room & Lounge leading to a covered veranda ideal for outdoor dining. 3 Bedrooms, 2 with Ensuite, (The third Bathroom is Downstairs) and deck opening onto a large veranda with spectacular views of the valley Telephone, DSL Internet Connection. Rent includes Utilities & housekeeper services twice weekly Rent is R$150 per day for 1 person / R$180 for 2 persons and R$20 per day per additional person. Santuario House - Across the street from the Casa, beautiful view over the hills: 3 rooms + 3 bathrooms, Sleeps 8 people. Kitchen fully equipped, indoor and outdoor living room, garden. Possibility to rent the full house. Gated community. 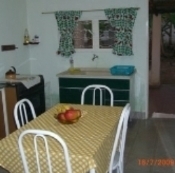 Prices are R$100 a day for a Suite or R$90 per day per person for two people in a room. 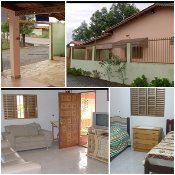 Other bedrooms are R$90 per day each per person or R$80 per day per person for two people in a room. The whole house is R$ 450/day. House keeping once/week. Payment in cash upon arrival. Villas Antonio - Luxury fully serviced private villas with two bedrooms, each with ensuite, lounge, dining and full kitchen. Complete with TV/DVD and lush gardens. Located just 150 meters from the Casa. Weekly or monthly rentals. Ideal too for small groups up to 16 persons. 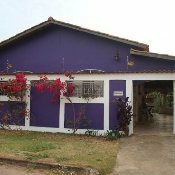 For full apartment, R$650 (US$370) per week short term. R650 (US$370) per week for a month or more. 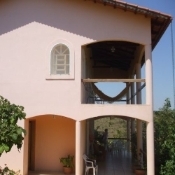 Description: Detached House located at: Rua Frontal B, S/N, Bairro Fazenda Capivary – Lindo Horizonte, CEP: 72940-000, Munícipio de Abadiânia, Estado de Goiás, Brasil, com área 894m2 de terreno (land: 9,595.38 sq. ft.), 110m2 de área edificada (constructed surface: 1,283.48 sq. ft.). 4 bedrooms, 2 full bathrooms, 1 living room, 1 laundry area, 1 porch, all gated house with electric protection and alarm, fully furnished. 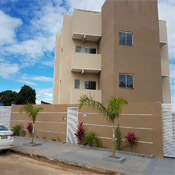 In RESIDENCIAL FORTE I you will find comfort and security for your family. Includes accommodation for up to five people. The apartments are completely furnished with TV, Sofa-bed, table, 6 door closet, 2 single bed and 1 double bed. Free WI-FI, full kitchen with all utensils needed to prepare your own meals. With Microwave, Sandwich maker, blender, washing machine, stove etc. One parking spot garage per apartment, bed linens and towels are provided. FEES: 5 people R$349,00/night, 4 People R$309,00/night, 3 People R$269,00 per night, 2 people R$199,00/night, 1 person R$160,00/night. Cleaning fee is R$100,00 per stay. WE ACCEPT VISA/MASTERCARD/ELO/AMERICAN EXPRESS/HIPERCARD AND DINERS CLUB. We are located 4 minutes walking from the Casa de DOM INÁCIO. Place an order here and have staple foods delivered to you at a specified date and time. Enjoy a nice home cooked breakfast your first morning in Abadiania! Gorgeous and cosy house with 1 bedroom, 2 bathrooms w/ shower, lovely living room, fully equipped kitchen with dining area. Porch with sitting area, beautiful garden, laundry room with washing machine, outdoor shower and terrace. The house is beautifully decorated, painted and furnished, with a high and uplifting energy. Its in a very quiet street. 5 min walk from the casa. Price includes all services, internet, weekly cleaning, monthly gardening and a Portuguese/English/Spanish/French speaking manager at your service. 85R$ 1 person. 120R$ 2 people per day. 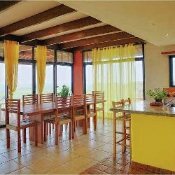 Casa Beijaflor is a newly built, very cute, clean and private, with a spacious veranda. The house comes with, WiFi, a clothes washing machine, a cleaning person once a week, and utilities are included. There are two bedrooms, a living room, a split toilet room and shower room, a very nice, fully stocked, open concept kitchen. In 1bedroom there is a queen sized bed and in the 2nd bedroom a Double bed, both with memory foam toppers (VERY comfortable), lots of storage space. All of the sheets towels blankets are cotton and come from the States. 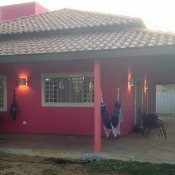 The house is located 5 min walk to the Casa and steps away from the Jardim Dos Anjos Pousada, where you can eat your meals, if you like, for a good price (they have the best food in town). This is a sweet sanctuary to heal and relax. Casa Beijaflor (Hummingbird house) is $120.R a night for one person, and $50,R a night extra for a 2nd person, $20.R each for the 3rd and 4th person staying with you in the house. If you are staying for 30 days or more the cost is $100 a night and $40 for the 2nd person $20.R for the 3rd and 4th person.